So my simtracker button disappeared and I can`t get it back. Do you know a way I can get it back? that sounds like a technical issue, you would need to ask EA about that if closing the game and opening it again doesn’t work. For the salsa dancing hobby, how do you get to the villa? My sim was sent home and no other sim was there. You can’t get to the villa for the hobby, once you have completed the quest you can no longer access the villa- unless you complete the hobby in the 7 day time limit and buy one for your own town. How do I get the Spanish villa, it is a reward for finishing the dancing quest. the villa is a reward for completing the salsa dancing hobby in the 7 day limit. My Salsa quest suddenly switched to the ghost hunter quest and when I finished that, it went to the Seniors quest. The Sim from the future wants to go to the snow park, but my game hasn’t let me build anything since refusing the high school. It keeps saying I can’t build because “Stable” is already being built in Sim Town. I have no idea what it’s talking about. This is a timed quest. I would like to be able to finish it. Help,!!! do you have a stable for a horse that is being built right now? How do I get access to this quests? I see the “overview” advert that says “get started” but don’t see any way to do that? I have rebooted the game. Uploaded/saved data to the cloud and deleted/reinstalled the game..I can’t see to find it. (In the “active tasks” section, I only see the weekly and neighbor options..) What am I doing wrong, where should I look? what quest? the post you are commenting on is a hobby. Are you taking about the a dance to remember quest? that unlocks the salsa dancing and this hobby? To start that you need to go to the park and click on the dancers. I have been growing weary of all the back to back timed quests and hobbies since the magic one, but I wanted the villas unlocked, so I finally gave up and used 6LP’s on a lucky spin for the salsa hobby and got lucky the first try! (whew). I am also unimpressed with the prize on the breakdancing hobby. I’ll complete it, but not within the time limit unless I do it on my own. I wanted to thank you so much for the advice on earning LP’s though! Very helpful, I have most of my sims working on hobbies and it’s really paying off! Your blog is an awesome resource! Thanks! Added to the post, I didn’t think it would just be lights in the pack but I couldn’t find anything else! Please help me, I finished the dance quest and can’t find the villa. I’ve had houses on all my lots at one time so when I click on an empty lot the various house options don’t come up.b it’s not in the home store or my inventory. Please please help! It isn’t in the store or the inventory, you need an empty plot to be able to buy and build the house. Do you use the sims game connected to your Facebook? Because I’ve looked at your town and some of the quests you have completed and posted you haven’t even built the place it talks about. I’m just confused as to how you are doing that? My first game is the one where I have done the life dreams quest and the book of spells quest which I have completed but that game is connected to my game center- which is full so I can’t add anymore people. Do you get the villa for free? Once you finish the salsa hobby in time p? I can’t find the boombox anywhere. Not in the hobby center and not in any of the sections of the house store if you get what I’m saying. Am I missing something obvious? Thanks for all your hard work. It really helps. have you completed the salsa dancing hobby? If you have, have you tried looking in the featured section of the buy mode? Umm, How Can You Start Doing The Breakdancing Hobby, Cause About A Week Ago I Finished The Salsa Dancing Hobby. The Adverts Come Up Of Breakdancing Then Says Get Started Now, But Whenever I Press ‘ Get Started Now ‘, It Just Goes Back To My Town? you need to buy a boom box, like it says in the post. When I finished the dance to remember quest I selected ‘Not Now’ to the breakdancing hobby. Now I cannot find the boom box (it is not in Promotions R Us store) to be able to begin working towards the breakdancing hobby. I tried closing out the app and restarting a couple of times. Any suggestions? It will be in the hobbies section of promotions r us or you could look in the featured section of the buy mode. hi, your blog is REALLY helpfull! i just had a question. i saw at this post that you said that lucky spin isnt worth it? what is the “lucky spin” ??? wait, if you have just finished the quest you will need to be looking for the jukebox to do the salsa dancing hobby, not the boombox to do the breakdancing hobby. The DJ booth is is really not worth it. You already have one when you build the Sims night club and while your Sim is Dj’ing you can have your other Sims dance. The best part is that while your Sims are dancing they are socializing at the same time. A fast and good way to keep their friendships up. Is there ANY benefit to completing the breakdancing hobby within 7 days? I’m just wondering why they bothered putting a limit on it if you get the same items at the same cost (nothing free) whether you finish in 7 days or 17 days. I was actually considering using LP’s for this. I have 1 day left and 3 trophies remaining. But what I am taking from what you wrote is that there is no benefit at all to finishing on time. 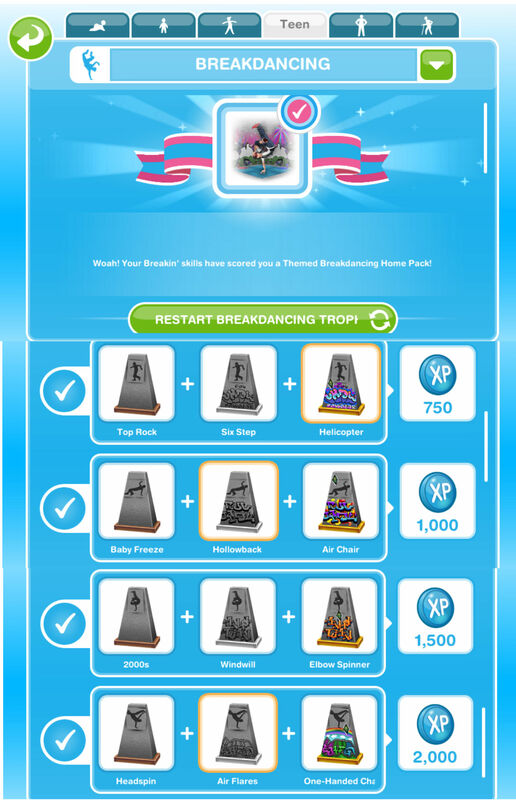 you won’t get the dj booth if you don’t complete in 7 days but you will still get the breakdancing set when you finish. For 4 days now I have had all the trophies except the very last one. For some reason it’s not giving me the last trophy. Could this be a glitch or extremely bad luck? Same boat for me, too. I’m so pleased you think the reward isn’t worth it – now I’m not fussed on doing it within 7 days. I never have any luck with these timed hobbies. It seems like I am stuck in the same place as you, and its been WEEKS for me! The last one: bottom row on the right?! I hope you have succeeded by now! You should figure out a way to connect the one you use constantly to your Facebook I wish I could see your town as a reference to what it should like in higher levels and I don’t even have an iPhone so I don’t even know what a game center is.. I have connected the one I use constantly to a facebook account. To this one that we can see or a different Facebook? The one you can see. Thanks for your wonderful blog. Like Rebecca I have been waiting days to get the last breakdancing trophies. I was down needing 2 about 3 days before the end if the “get DJ booth” time. Now a day over and finally got one of the 2 I still needed. 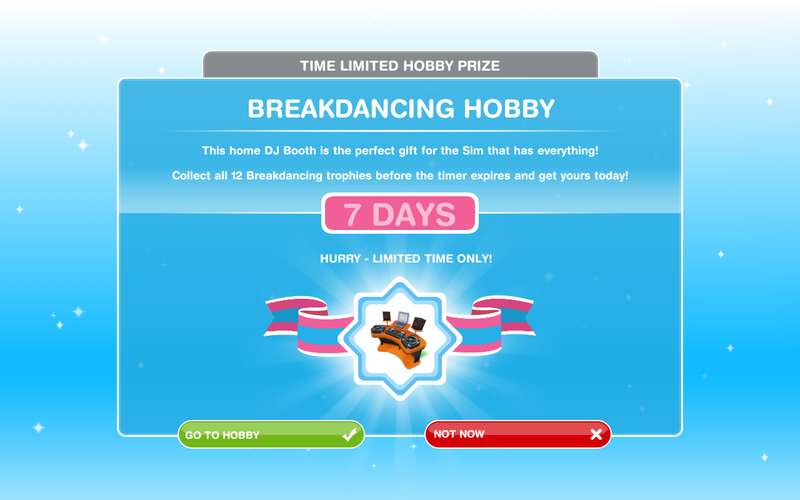 Thanks for the comments about the “lousy” DJ booth prize, it meant I wasn’t upset when the deadline passed….. Now if only my Sim can get that last trophy! i LOVE the breakdancing lights!!! 👍👏 they are so cool! I was hoping for breakdancing clothes too! I wanted to dress my Sim in the outfit he puts on when he breakdances. Oh well. Thanks again for your always helpful posts! I just finished the dance to remember quest, but now I can’t find the breakdancing boombox at careers r us to start the breakdancing quest. I am doing the breakdancing quest and got the boom box. Do I need to purchase the breakdancing mats also? Can’t find a reference to them here. Where can you find the breakdancing map? From the promotions r us store once you complete the salsa dancing hobby. Thanks for the post! Needed it to see what the prize ‘home pack’ included. If you can find a neighbor who has unlocked the breakdancing hobby, you can have a second sim do it in their town. Doubles your chances of finishing the hobby on time. Hey.. I am trying to find a neibour who has a breaking dance boom box but I can’t find.. can u help? The lucky spin never works!!! I did a cloud save before I used it, and I have one medal left for this hobby. Every time I don’t get the medal I need, I reset the game then go to the cloud save. I keep doing the spin but it lands on the other two medals of Level 4 everytime and it’s really annoying. I didn’t complete the salsa dancing hobby within the time limit so was unable to unlock the Spanish villa. Long shot but is there ANY way to unlock it after the quest is finished or any chance of the villa coming up again in future do you think? It tells me I need to do the cheer on task for the juke box but it won’t let me my sims say no and won’t do it. I don’t know what to do the dancers are in the park and not clickable and I re did the ratings at the table task and still nothing. I’m running out of time.. Help! Okay, so like I can’t find the breakdancing outfits. They said it would be available as soon as I finish the hobby and I did. I can’t find them. I completed the salsa dancing quest and unlocked the Hobby but am unable to do the hobby because i can’t find the jukebox! When i go to promotions r us, it says I can’t have more than one jukebox per simtown. But don’t have it anywhere! Not in my inventory or any homes. I thought it meant the one at the villa, but after reading these comments…I can’t go back to the villa since i completed the quest. Please help! Is it in the featured section of you home store? If not I don’t know why it isn’t there, you may need to contact EA to see if they can fix this issue for you. The jukebox is not in the promotions r us store. Where else can I look? I don’t have a boom box, even though I finished the salsa quest (not in time, I missed out on the villa) I have a teen now, and a breakdancing mat, but no boombox so he can’t dance!!! What other hobby can he do? I don’t have a snow park yet, I just built the high school. Also, where can I get the boom box? So you finished the dance to remember quest? Have you done the salsa dancing hobby? 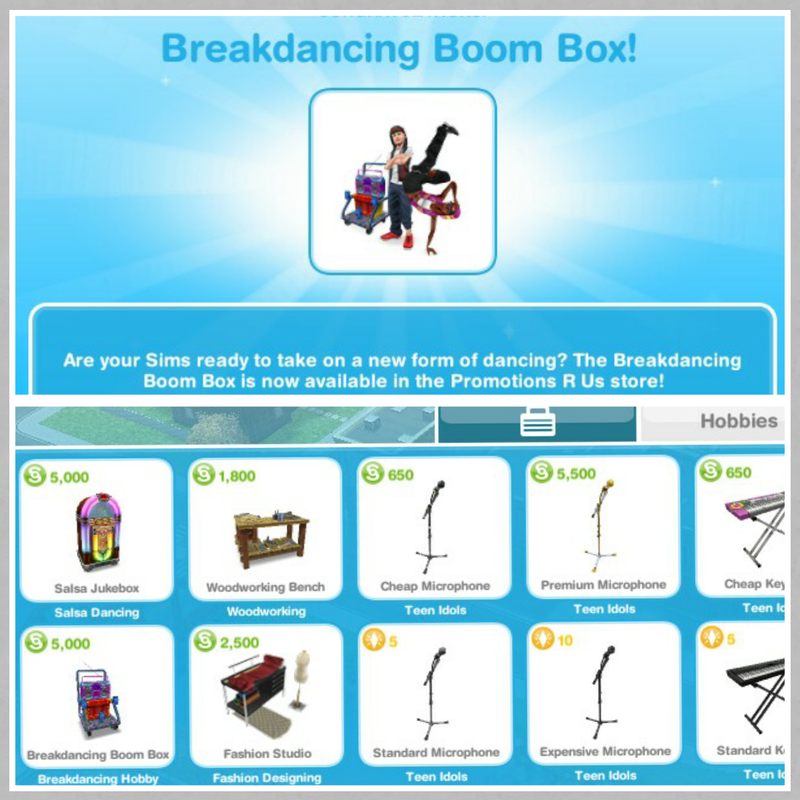 You need to complete this first by buying the jukebox from the promotions r us store: https://thegirlwhogames.wordpress.com/2015/01/07/the-sims-freeplay-hobbies-salsa-dancing/ then once that is complete you can find the boom box in the promotions r us store to start the breakdancing hobby. I’m glad I read this, the salsa hobby all but drove me nuts trying to collect all the trophies in time. Had to use a LOT of Lps on the lucky spin otherwise I wouldn’t have been able to complete it in time. This one, however, is much harder. Been trying to collect trophies for 4 days and I just keep getting the same 3 all the time. I’ve almost unlocked all the levels yet I’m getting nowhere. I definitely don’t want to waste Lps this time and I’m glad you don’t think the prize is worth stressing over so I’ll just relax and not worry about the time limit. Thanks for the tips, you’ve made playing this game a lot easier. Yeah it really isn’t worth it! The first time through Breakdancing, do you have to do the 10 hour break? I’m having trouble getting 4 of the last trophies (3rd and 4th level ones) and wondering if doing a few 10 hour breaks will help. When you are trying to level up you should do the longest option as you will level up quicker then you can just do the short option to find all of them, there is no need to do the long option when you have a sim at level 6. OK thanks for tip. I’m at Level 6 already so I guess I’ll just keep at it with the short breaks. I already missed the booth but it sounds like it’s not a big loss.